Scientists at the Harvard John A. Paulson School of Engineering and Applied Sciences (SEAS) have formulated a new method to squeeze infrared light into ultra-confined spaces, producing an intense, nanoscale antenna that could be used to sense single biomolecules. The scientists have harnessed the polariton’s power. Polaritons are basically particles that distort the distinction between light and matter. This ultra-confined light can be used to detect very tiny amounts of matter close to the polaritons. For instance, many dangerous substances, such as formaldehyde, have an infrared signature that can be enlarged by these antennas. The size and shape of the polaritons can also be tweaked, opening the doors for smart biosensors and infrared detectors. The study has been reported in Science Advances. This work opens up a new frontier in nanophotonics. By coupling light to atomic vibrations, we have concentrated light into nanodevices much smaller than its wavelength, giving us a new tool to detect and manipulate molecules. Federico Capasso, the Robert L. Wallace Professor of Applied Physics and Vinton Hayes Senior Research Fellow in Electrical Engineering, and the study’s senior author. Polaritons are hybrid quantum mechanical particles, composed of a photon robustly coupled to vibrating atoms in a 2D crystal. “Our goal was to harness this strong interaction between light and matter and engineer polaritons to focus light in very small spaces,” said Michele Tamagnone, postdoctoral fellow in Applied Physics at SEAS and the paper’s co-first author. The scientists constructed nano-discs - the smallest measuring around 50 nm in height and 200 nm in width - composed of 2D boron nitride crystals. These materials behave as micro-resonators, capturing infrared photons and producing polaritons. When irradiated with infrared light, the discs could concentrate light in a volume thousands of times smaller than is possible with regular optical materials, such as glass. 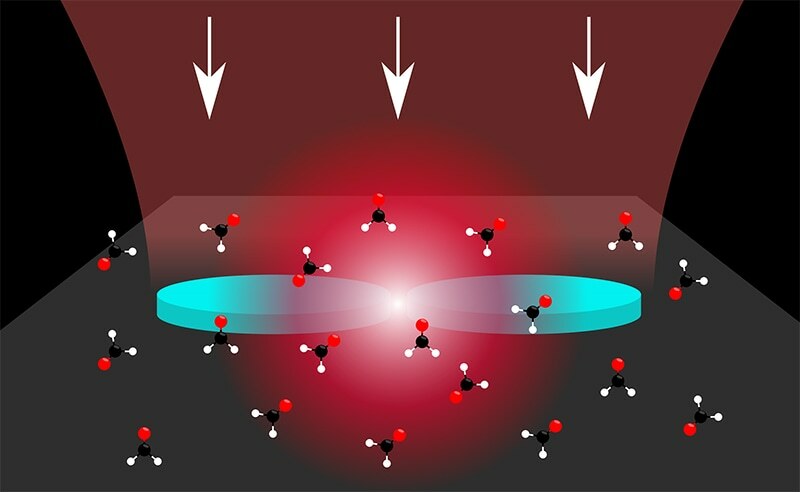 At such high concentrations, the scientists observed something unique about the behavior of the polaritons: they oscillated like water sloshing in a glass, altering their oscillation based on the frequency of the incident light. If you tip a cup back-and-forth, the water in the glass oscillates in one direction. If you swirl your cup, the water inside the glass oscillates in another direction. The polaritons oscillate in a similar way, as if the nano-discs are to light what a cup is to water. Michele Tamagnone, postdoctoral fellow in Applied Physics at SEAS and the paper’s co-first author. In contrast to traditional optical materials, these boron nitride crystals are not restricted in size by the wavelength of light, meaning there is no restriction to how small the cup can be. These materials also have minute optical losses, meaning that light limited to the disc can oscillate for a long time before it becomes calm, making the light within even more strong. The scientists further concentrated light by positioning two discs with matching oscillations adjacent to each other, capturing light in the 50-nm gap between them and forming an infrared antenna. When light concentrates in smaller and smaller volumes, its strength increases, thereby developing optical fields so strong they can apply measurable force on adjacent particles. A future challenge for the Harvard researchers is to enhance these light nano-concentrators to accomplish intensities high enough to improve the interaction with a single molecule to detectable values. This study was co-authored by Kundan Chaudhary, Luis A. Jauregui, Philip Kim and William L. Wilson. The National Science Foundation and the Swiss National Science Foundation supported the study.